When out-of-work engineer Duke Evans and his family try to rebuild their lives in a remote mountain town, their own version of the American Dream is cut short on the day a devastating cyber-attack destroys the U.S. as we know it. Every microchip ‘Made in China’ has been infected with a virus that rapidly shuts down all modern technology. The aftermath happens fast, and as the rule of law, water, and food run out, Duke and his family must use all their wits and the unlikely help of Alonso, an illegal immigrant, to survive this frighteningly realistic scenario. Secretly I’m actually a fan of low-budget movies. Firstly, because sometimes there are surprising things to see in this niche market. Occasionally you’ll encounter a rough diamond that would be a real gem if it was better cut. Secondly, the authors usually aren’t really concerned about the public opinion and there is no fear to step on someones toes and go against the grain. This is also the case with “Dragon Day” (or “Invasion Day” as it’s called on the European continent). They have ensured that actually most of the moviegoers will avoid this film. First, the American public really won’t be happy about the outcome of this film. Usually a movie ends with an epic, grandiose victory where the “We will prevail” and “God Bless America” ​​slogans are chanted ad nauseam. In this film they surrender and they align themselves on the side of the invader. And secondly, the Republic of China won’t give this film a standing ovation, as they are portrayed as sneaky intruders, bringing the American society down in a devious way. With low-budget films there are always some certainties (of course there are exceptions). Usually the performances are pretty pitiful to downright terrible. And the special effects won’t blow your socks off. Usually it looks amateurish, with pale camera images and a downright bad timing. There is usually no impressing soundtrack. The only thing that usually keeps a low-budget film afloat, is an intriguing and clever put together storyline, that will keep your attention. 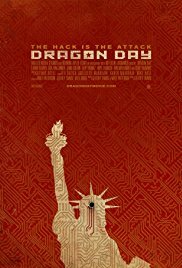 Eventually I found this “Dragon Day” fairly successful in that area and I could sit through the whole movie without any problem. Despite the fact that there are here and there some shortcomings. Even the end surprised me. Duke Evans (Ethan Flower) is an NSA analyst, who is suffering a huge financial burden and who got fired on top of that. Apparently he inherits a country-house somewhere in the mountains (by the way, architecturally it’s a nice cottage) from his grandfather and moves with his family to this area. Arriving there, they discover that there is a Mexican renting and maintaining this house for some time. While the police removes this intruder, a plane crashes down in the immediate vicinity. Slowly, everything starts to fail : cars, electricity, water, communications, television broadcasting, … Turns out there is an invasion performed by China because the U.S. has a trillion debt to this country and don’t want to pay it back. China claims the right to occupy the USA. And, this is simply done by use of the millions of chips that are incorporated in electronic devices with “Made in China” on it. Through a backdoor, a virus is released in the American society after which everything is thrown back in time 30 years. Don’t expect impressive images of a imploding White House as in “Independence Day” or continuous action as in “White House Down“. The special effects are limited to a few ugly plumes of smoke that insinuates a plane crash. And a panoramic view of an American city in ruins. The emphasis in this movie lies on the collapse of a society where human values ​​are pushed aside and the survival instinct comes up, resulting in debauchery and cruelty. “Invasion Day” shows the desperation because of the lack of basic needs such as food and water. Perhaps the idea that an entire continent can be paralyzed, by disabling its electronic network, is a bit excessive. Yet this is not inconceivable since we are depending on that entire network. In this age of hackers, spam, viruses, spyware, malware, Stuxnet (a virus designed to sabotage industrial processes from nuclear plants in Iraq), cyber-stalking, DDoS attacks, phishing and e-Fraud, such a scenario isn’t unlikely. Obviously not on such a large scale, but still disastrous enough. I read on Wikipedia: “The federal government of the United States admits that the power grid is susceptible to cyber war. In April 2009 ,according to current and former national security officials, there’s reported that China and Russia had infiltrated the U.S. electrical grid and left behind computer programs that can be used to disrupt the system. “. Seems to me it’s not really fiction anymore. Ethan Flower takes the lead on his behalf. For me, a totally unknown person (like most of the cast) who eventually performs well enough even though he sometimes acts like a dull vegetable. All in all a pleasant and convincing performance. Asa Wallander is something else. She annoyed me from the beginning. Terrible overacting and sometimes downright bizarre reactions (which of course is a bit the fault of the script) like when she gets angry at Duke because he spends not enough time with them and he doesn’t do his best to get them out of this situation. Personally, I would have used a sledgehammer on her. The best performances were (for me) Eloy Mendez as the resident Mexican and William Knight as the elderly neighbor Albert Grimes, who really looks forward to killing some communists again. Despite the interesting story, there were still some implausible facts. There are some passenger planes crashing and Duke has immediately the brilliant idea that it’s an invasion. After shattering several cellphones and seeing chips with “Made in China”, he immediately concludes that China is responsible. If you are asked to fill a bath with water,and there is no bath, then the decision to just fill one small can is apparently the logical thing to do. I know that potatoes contain electricity. I’m sure that they had “Duracell” potatoes, because they lasted very long. How the bracelets exactly could determine the identity is phenomenal and the way they liquidate persons who commit an offense, is also exceptional. All in all a pleasant surprise that had some strong content but visual wasn’t that overwhelming. Duke however is fortunate that the device he used in the end didn’t have any Chinese chips in it. Otherwise, it would be an extremely grave situation for him.